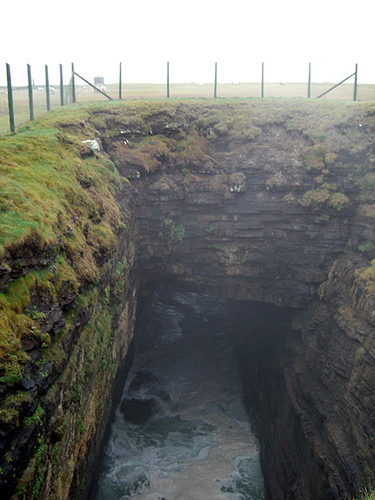 Often referred to as a Blowhole, this area of Downpatrick Head provides the visitor with a clear view of the fault line which exists in the rock formation. The softer rock has been eroded by the constant action of the waves and this is evident at three locations where erosion has worked its way to the surface. Pul Na Sean Tinne is the largest area of collapse and has been recently developed to allow the visitor a closer and safer viewing experience. An older view of Pul Na Sean Tinne before the recent upgrade work. During stormy weather and rough seas the hole has been seen to expel foam and vapour, giving the appearance from a distance, of smoke rising from a fire. Downpatrick Head is a free for visitors to enter. If you have enjoyed your visit and would like to make a donation to the owners please use the secure payments method. Proceeds enable us to upgrade facilities and information. A proportion of profits will be donated to the Irish Bird Sanctuary.